The Icelandic Met Office has issued a yellow alert and a gale warning for the capital region, for Faxaflói bay in Southwest Iceland, for West-Northwest Iceland and the central highlands. Please be advised that there will be hazardous driving conditions for vehicles sensitive to strong winds. No travel is advised in the central highlands. Mild temperatures have resulted in rapid snowmelt in North Iceland this week, causing localized flooding. In the Southeast, considerable rain is forecast, accompanied by rapid snowmelt. Rivers and creeks are expected to swell significantly. For the capital area and Faxaflói bay, the weather warning will be in effect from noon till 6 pm. 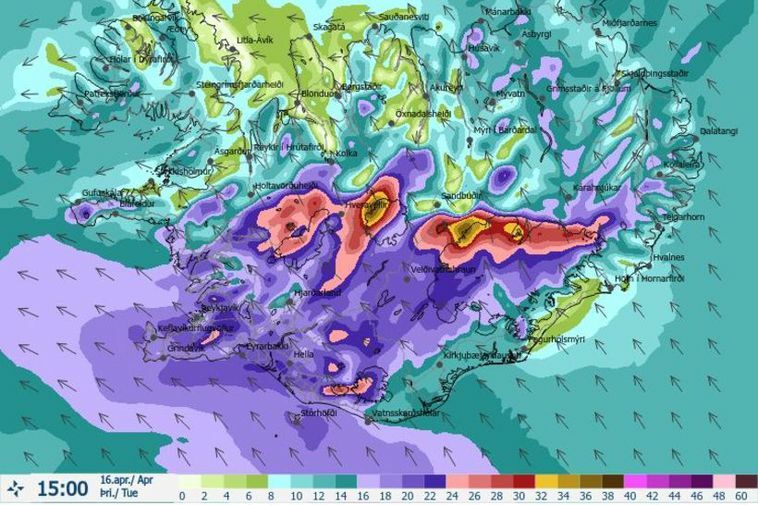 A southeast gale of 13 to 23 m/sec is expected, with wind gusts reaching 35 m/sec in Kjalarnes, in Hvalfjörður fjord, by Hafnarfjall mountain, and elsewhere near mountains. For Breiðafjörður fjord, there is a gale warning, effective from 5 pm today till 4 am tomorrow morning. A southeast gale of 15-23 m/sec is forecast, with wind gusts of up to 35 m/sec on the Snæfellsnes peninsula. In the central highlands, a severe gale warning came into effect at 7 am and will be good through 3 am tomorrow morning. Southeast gales of 18-25 m/sec are expected, with wind gusts reaching 35-40 m/sec near mountains. Travel conditions in the central highlands are dangerous. In addition to the severe weather, please note that roads in the highlands are generally very muddy right now, making driving there unadvisable. Daytime temperatures will range from 7 to 15 degrees C (45-59 degrees F) today, warmest in the north. Please follow the latest weather forecast on en.vedur.is.